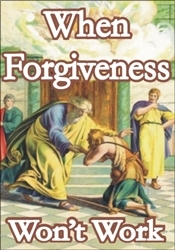 There is confusion among many Christians about the matter of forgiveness because they do not realize that forgiveness has two sides. The first side is the side of the “forgiver.” Christians must forgive fully, freely, and forever. The second side is the side of the one being forgiven. To be offered forgiveness is one thing. To be able to receive the forgiveness offered is something else. Even though forgiveness is offered, FORGIVENESS WON’T WORK unless the one who has done the wrong is truly repentant. In the parable of the prodigal son, both sons were forgiven. But only one of them received forgiveness because only one of them was truly repentant! Those who encourage acceptance without repentance are really encouraging indulgence and enslavement. With repentance comes cleansing, restoration, and forgiveness.